El Niño and Global Warming—What’s the Connection? The United Nations has declared 2015 the hottest year since record keeping began. It was also a year marked by the occurrence of a “super” El Niño. El Niño is a phenomenon that disrupts normal weather patterns, bringing heavy rains and drought to different parts of the world. Are the warming temperatures and El Niño connected? Most scientists agree that the warming trend (2011 to 2015 is the hottest five-year period ever) is due to greenhouse gases humans have put into the atmosphere. But 2015’s warming of 0.9˚C above the average for the 20th century was the “largest margin by which the annual global temperature record has been broken,” according to the National Oceanic and Atmospheric Administration, because of the presence of a strong El Niño. El Niño is a complex and naturally occurring weather pattern that results when ocean temperatures in the Pacific Ocean near the equator vary from the norm. The phenomenon typically occurs every two to seven years. The 2015-2016 El Niño, however, is being called a “super” El Niño, the worst in 15 years. The two previous super El Niños occurred in 1982-1983 and 1997-1998. Normally­—that is, in years when El Niño does not occur—strong trade winds blow from east to west across the Pacific Ocean around the equator. The winds push warm surface ocean water from South America west towards Asia and Australia, and cold water wells up from below in the east to take its place along South America. This creates a temperature disparity across the Pacific, which also keeps the trade winds blowing (the temperature difference and the trade winds reinforce each other). The accumulation of warm water in the west adds heat to the air, causing it to rise and create unstable weather, which is why the western Pacific region is warm and rainy. Cool, drier air is usually found on the eastern side of the Pacific. In an El Niño year, the trade winds weaken or break down. The warm water that is normally pushed towards the western Pacific washes back across, piling up on the east side of the Pacific from California to Chile, causing rain and storms. Although El Niño’s strongest impacts are felt around the equatorial Pacific, they can affect weather around the world by influencing high and low pressure systems, winds and precipitation. And as the warmer ocean waters release excess energy (heat) into the atmosphere, global temperatures rise. Often, a year after an El Niño, the pendulum swings back and La Niña occurs, which is an intensification of the normal pattern. The trade winds blow harder from east to west, and more cold water wells up on the east and moves west, resulting in weather patterns that are the reverse of El Niño. The western Pacific is rainier and flooding can be severe if following El Niño-induced droughts; northern Australia often experiences more cyclones. Cooler temperatures and less rainfall occur along the coast of South America. 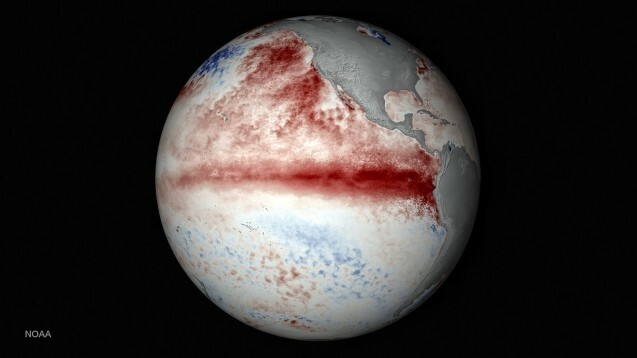 Together, the cycling of El Niño and La Niña is called El Niño Southern Oscillation (ENSO). 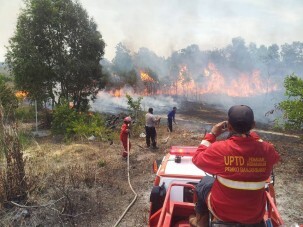 The changing weather patterns can having damaging impacts on agriculture, fisheries, ecosystems, health, energy demand and air quality, and increase the risks of wildfires around the globe. 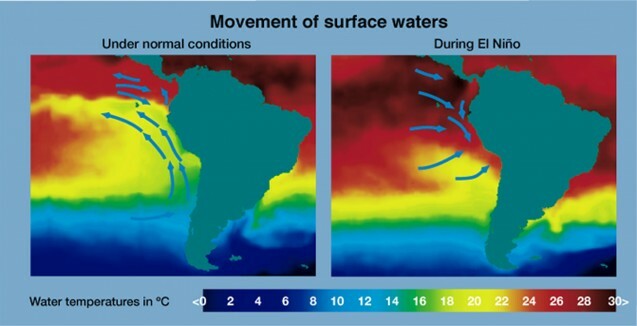 Sea surface temperatures usually peak around December (The phenomenon was called El Niño, Christ Child in Spanish, because of the time of year it generally occurs. ), but bigger impacts are often felt a few months later as global oceans gradually heat up. This year’s El Niño will likely last through March and could persist until May. It has already increased temperatures in the central and eastern Pacific up to 2.78˚C higher than normal. 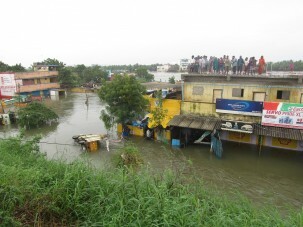 So far, typhoons in the Pacific, wildfires in Indonesia, heavy rains and floods in southeastern India, and flooding of the Mississippi River have been attributed to El Niño. The Earth Institute’s International Research Institute for Climate and Society forecasts that spring will likely bring drier conditions over northern South America, southern and central Africa, southeast Asia, western Canada, western Alaska, the northern U.S., western Africa, southern India and Sri Lanka. The U.S. South, northern Caribbean, coastal Ecuador and Peru, southern Brazil and eastern Paraguay will likely experience increased precipitation. Even without El Niño, 2015 would have been a record warm year, but climate scientists believe El Niño was responsible for 8 percent to 10 percent of the warming. Gavin Schmidt, director of the NASA Goddard Institute for Space Studies, estimated that El Niño accounted for 0.07˚C of the above average warming that occurred in 2015. Adam Scaife, head of long-range prediction at the U.K.’s Meteorological Office, expects that El Niño will contribute 25 percent of new record global temperatures in 2016. Scientists know that El Niño contributes to an increase in global temperatures. But do rising global and ocean temperatures, in turn, intensify El Niño? The science here is as yet inconclusive. One 2014 study suggests that super El Niño events could double in the future due to climate change. Using 20 climate models to examine possible changes in El Niño over the next 100 years, the scientists projected that extreme El Niño events could occur roughly every 10 years instead of every 20. A recent report studying the amount of heat the ocean has absorbed since 1865 found that nearly half of the industrial era increases in ocean warming occurred in the past 20 years, with over a third of that heat being accumulated below 700 meters. Twenty years ago, the deep ocean contained just 20 percent of the extra heat from greenhouse gas emissions. 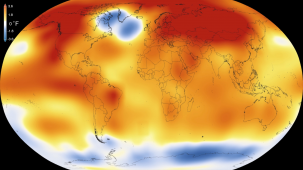 This finding actually has to do with La Niña rather than El Niño, explained Goddard. La Niña generates stronger trade winds, so the sea surface gets colder, drawing more energy (heat) out of the atmosphere. As the warm water accumulates in the western Pacific, it pushes large amounts of warm upper ocean water down deeper than usual, where the heat is stored. There is an ongoing variable but steady increase in ocean heat content, but no one yet knows how that might affect El Niño. 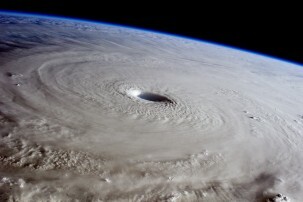 An early start to the West Pacific typhoon season in 2015 due to El Nino. Scientists are working on it, however. One of the World Climate Research Programme’s CLIVAR (Climate and Ocean: Variability, Predictability and Change) projects is bringing together scientists from around the world to study “ENSO in a Changing Climate.” CLIVAR says that it has not been possible to determine how ENSO will be affected by changes in coming decades because there has not been long and comprehensive enough observation of ENSO phenomena, and because the ability of computers to model the complex interplay of the many ocean and atmospheric processes involved in ENSO is limited. The project’s goal is to better understand how different physical processes influence ENSO and the variability of El Niño events over decades. This research is critical, because future El Niño events will unfold against the background of global warming. Michael Jarraud, former secretary-general of the World Meteorological Organization, warned that El Niño could be “playing out in uncharted territory.” “This naturally occurring El Niño event and human induced climate change may interact and modify each other in ways we have never before experienced,” said Jarraud. Why do scientists continue to argue that “climate change” is causing more intense El Nino events without any real proof of such? I like how you point that it might all be interconnected. That intense El Niño and El Niña events could be in fact one of the consequences of global warming, even though this hasn’t been proven yet as chuck pointed out. I think that in conclusion, it can be said that no matter how much the El Niño actually contributed to the sudden increase in temperature, greenhouse gas emissions still caused some if not most of it. Human-induced climate change is a huge threat and we need to reduce this emission significantly to assure our planet’s sustainability. Scary stuff! I think it is more a question of when – rather than if – the link will be conclusively proven. I would like to know the links between el nino and drought ? Its interesting to know about the relationship between El nino LA Nina, global warming and storms. I wonder what would happen if we ended these events forever? i feel like it should include more information about La Niña.